The event will also be live streamed on KING5.com. “Seafair is excited to work with KING 5 and KONG-TV to bring this year’s live broadcast of the Albert Lee Appliance Cup and the Boeing Air Show to TV viewers in the Seattle region. KING 5’s commitment in supporting Seattle’s iconic community events and festivals means you can enjoy Seafair Weekend on site, on KONG 6, streaming on your mobile device or from your easy chair.” – Richard Andersen, CEO and President of Seafair. KING-TV is an NBC affiliate while KONG is an independent station. 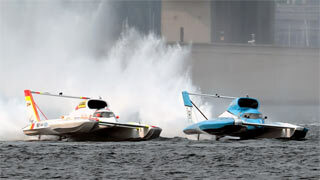 This marks the return of a Seattle tradition of broadcasting Unlimited Hydroplane racing on live TV after a one year absence.